Applicants may obtain Property Tax/Rent Rebate claim forms (PA-1000) and related information at the Department of Revenues website, revenue.pa.gov, or by calling 1-888-222-9190. Applying for the rebate is free, and my office offers free assistance to fill out and file the applications. Even if you applied for a rebate last year, you must file again this year since the rebates are based on annual income and property taxes or rent paid in each year. Also, spouses, personal representatives or estates may file rebate claims on behalf of claimants who lived at least one day in 2018 and meet all other eligibility criteria. The easiest way to check the status of a rebate claim is to visit the dedicated website that the Department of Revenue maintains at doreservices.state.pa.us/Individual/RebateDefault.htm. Property Tax/Rent Rebate Program claim forms (PA-1000s) are loaded into the Department of Revenue’s processing system in late April. There will be no information available on a claim until that time. 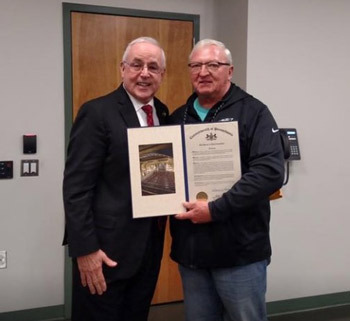 It was an absolute pleasure to present a house of representative citation to Chief Stanley Jasinski Jr. on his retirement from the Palmyra Police Department Tuesday evening. We owe a tremendous debt of gratitude to all of our police officers and first responders. See more on my Facebook. 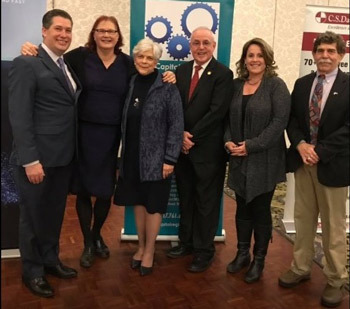 I was pleased to serve as the guest speaker Tuesday at the Capital Region Council of Governments at their annual dinner. It was great to see so many dear friends there and to spend an evening with fellow lawmakers Reps. Tom Mehaffie (R-Dauphin) and Sheryl Delozier (R-Columbia). My topic was the presentation of our financial rescue plan, property tax elimination, and facing our problems head on acting as statesman for the long-term future and survival of our Commonwealth. It was also tremendous to see last year‘s Youth Development Recipient receive her award this year for Youth Development – Rebecca Daubert. Well done to the entire YMCA staff and to Phil Tipton, CEO! See pictures and comments on my Facebook here. Following the events of Sept. 11, 2001, the federal government developed a more secure form of identification, known as REAL ID, for Americans seeking to fly domestically and/or enter certain federal buildings. Full implementation of REAL ID is scheduled to go into effect Oct. 1, 2020. PennDOT is preparing to offer the new identification to Pennsylvania residents starting in March 2019. However, it important to note that obtaining a REAL ID is optional, and that PennDOT will continue to offer standard-issue driver licenses and photo IDs to those who want them. Pennsylvania residents who decide to get a REAL ID may begin the pre-verification process now. Those who received their first license before September 2003 and want to obtain a real ID will need to bring the required documents to a Driver License Center so they can be verified in person. (Residents who received their first license after September 2003 have been able to pre-verify since March.) A checklist of required documents is available here. PennDOT staff will scan the documents to the customer’s record, and when REAL IDs are available in March 2019, the customer can opt into the REAL ID program online, and their REAL ID product will be sent through the mail. When REAL IDs are available, customers will have three options for obtaining a REAL ID product: pre-verified customers may order their REAL ID online; they can visit a PennDOT Driver License Center, have their documents verified and scanned, pay the one-time fee, and their REAL ID product will be mailed to them within seven to 10 days; or they can visit one of up to 13 REAL ID Centers and receive their REAL ID product over-the-counter at the time of service. One of the required documents is a certified copy of a birth certificate, which can take up to several months to process, depending on one’s circumstances. My office can help residents with birth certificate applications. Call or stop by for more information. More information about REAL ID, including frequently asked questions, can be found at dmv.pa.gov. The Pennsylvania Department of Environmental Protection (DEP) will begin accepting grant applications to replace, repower, or retrofit fleet diesel-powered trucks, buses, and other vehicles and equipment through the Driving PA Forward program. More than $2.6 million will be available. Mobile source emissions in Pennsylvania from sources like diesel engines account for nearly half of nitrogen oxide pollution, which can lead to ground-level ozone formation and poor air quality. Children and elderly residents are especially susceptible to health impacts such as asthma from poor air quality. Grants are available for both public and private entities, including school districts, local governments, and non-profit organizations. Applications will be accepted beginning January 18, 2019. The application package, including guidance and application instructions, is available electronically on DEP's Driving PA Forward webpage at dep.pa.gov/drivingpaforward or by contacting the Bureau of Air Quality by e-mail at ra-epvwmitigation@pa.gov or by telephone at (717) 787-9495. DEP will accept online applications until 4:00 PM on February 28, 2019. A webinar on the Pennsylvania State Clean Diesel Grant Program will be held on February 4, 2019. Tips cam be submitted anonymously or with your contact information included for follow up from the Office of Attorney General’s Bureau of Narcotics Investigations. During the 2019 Pennsylvania Farm Show, a memo of understanding was signed launching the High Performance Farms Initiative. President Trump’s EPA was a fantastic partner in bringing this to fruition. • Healthy waters rely heavily on the agriculture sector. Reducing pollution from stormwater runoff requires a holistic, regional and watershed approach encompassing rural, urban, and suburban sectors. • Practices that improve soil health also improve nutrient management and long-term sustainability of farms. • Organic feed and food is a growth market with long-term environmental, health, and economic benefits. This requires the development of market drivers and financial incentives to increase farmers’ transition from traditional practices. If interested, please calling my office (717) 556-0031 no later than Friday, Feb. 15. Candidates must also apply online at employment.pa.gov in the “Summer Maintenance Program” category under the Open Jobs section of the website.